In 1967, New York dealer Leo Castelli hosted an exhibition to celebrate the 10th anniversary of his Upper East Side gallery. Each of his artists contributed work to the show, and Andy Warhol (who came to the gallery late, after having two shows at Eleanor Ward’s Stable Gallery), put together a series of portraits, in a variety of sizes, of 12 Castelli artists: Jasper Johns, Robert Rauschenberg, James Rosenquist, Frank Stella, Donald Judd, Roy Lichtenstein, Robert Morris, Cy Twombly, Lee Bontecou, Larry Poons, John Chamberlain, and Warhol himself. Some of the works in the show were quite small, which turns out to have been an bit unfortunate. Explaining the works, Volume 2 of the Andy Warhol Catalogue Raisonné notes: “According to the Castelli inventory, several were stolen from the exhibit.” Thankfully for collectors, Warhol also made a rather unusual multiple of 10 of the portraits on polystyrene boxes. Each set of 100 boxes, featuring 10 portraits of each artist, were sold in a numbered edition of 200, plus 25 lettered copies. Perplexed, I contacted Patricia Hickson, the Emily Hall Tremaine Curator of Contemporary Art at the Wadsworth Atheneum, who consulted the work's object file. One of the notes in the file read: "Curiously, although Portraits in part of an edition of 200, the order and direction of the artists' images and the color bands vary among the serigraphs in the edition." But here is where things get especially interesting. Hickson explained that the work's frame can be opened, and the boxes can be rearranged, accounting for the differences in all of the images online. The work at the Wadsworth, though, has not been reconfigured since it was donated by super collectors (and serious Castelli clients) Mr. and Mrs. Burton Tremaine in 1977. 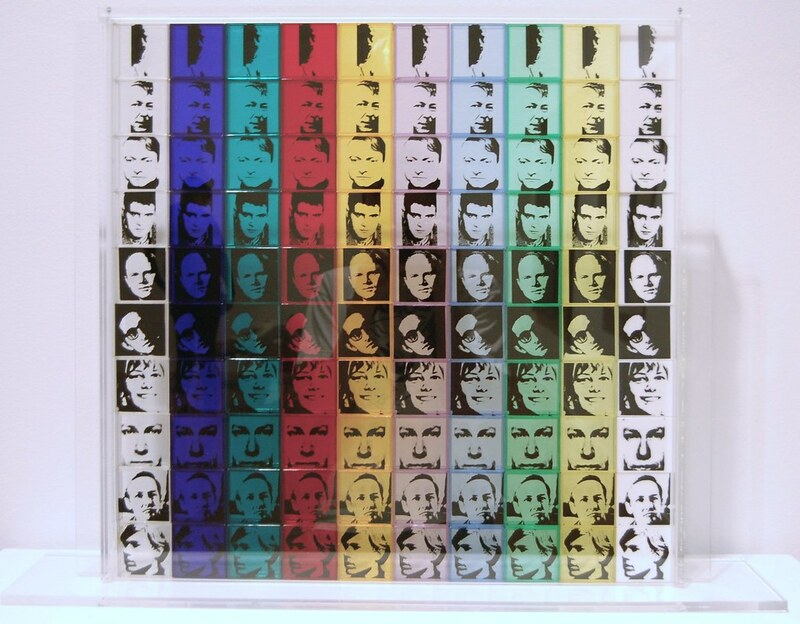 Earlier this month, I was going on and on about the mutability of Warhol's sculptures, about the fact that, if you happen to own a set of Brillo boxes, you can arrange the pieces any way you like. Here, Warhol has taken that idea to the next level. When the Brillo boxes are sold or moved, they lose their previous arrangement. But in Portrait of the Artists, the work itself records how collectors chose to configure the work. Which leads to a few questions: did the Tremaines rearrange their copy, or does the work they donated to the Wadsworth show how Warhol originally displayed the work? (Or was was each copy sold in a different configuration?) Does it even matter what the original layout looked like? A final question: who was cut from the 12 artists whose portraits were featured in the Castelli anniversary show in order to make a group of 10 plastic boxes? This, at least, we have an answer to, thanks to the Catalogue. It turns out that Warhol removed Twombly and Chamberlain. Which is interesting: Chamberlain was one of his favorite artists (Warhol collected his work), but he may have been a bit tired of Chamberlian’s portrait, having traded 316 — yes, 316 — copies of it to Chamberlain in exchange for a metal sculpture called Jackpot. (Chamberlain assembled 315 of the portraits into a single rectangular work that he called 315 Johns.) As for what is going on with the wood frame of one of the examples sold at Christie's, I don't even want to think about it. Key: The artists in the Wadsworth Atheneum’s piece (shown at top), in order from top to bottom: Robert Morris, Jasper Johns, Roy Lichtenstein, Larry Poons, James Rosenquist, Frank Stella, Lee Bontecou, Donald Judd, Robert Rauschenberg, Andy Warhol.